Luciano is proud to invite to his beloved Santiago de Chile three of the most dazzling stars of the galaxy. Sven Väth, Richie Hawtin and Loco Dice and the Magi-K Luciano himself will light up the skies upon the Magik Garden in The Piscinas Broadway. A remarkable festival with four unstoppable globetrotters of the dance music pantheon, gathered together for an endless blazing beat. Not only them, they will also be supported by an invincible squad of South American djs: Franco Cinelli Alejandro Vivanco Felipe Venegas GustavoAllendes, DJ Umho, Pablo Inzunza some new talents from the Dj School Chile and more national artists to be confirmed. The Magik Garden parties are very organic: they start early in the day in a fresh and green surrounding filled with colourful plants and trees. The Magik Garden concept was invented by Luciano for a series of parties he started to do at the D!Club in Switzerland, parties which start early in the afternoon and that are opened to a wider audience, including very young people. 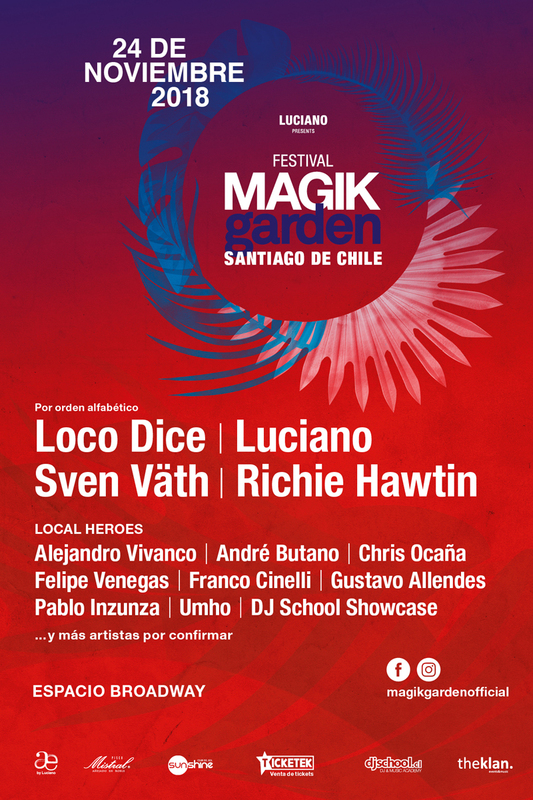 There will be more than 15 hours of music at Magik Garden Chile, powered by an earth-shaking Soundsystem. There will be different areas, including a swimming pool that can be used during the daytime, green zone for chilling, barbecue and food trucks. The festival will be equipped with an extended parking zone. Make sure you don’t miss this unbelievable party and keep your eyes open for further information and tickets presale. We are already counting the days to the event, quivering to share with you a day and a night of fabulous music and hot-blooded dance in a garden of an urban paradise.